Pathways to Wellness . . . This is also a popular option with some of our corporate clients who offer seated chair massages to their employees as a reward, as a means of reducing workplace stress or as part of a wellness program. For more information on how to provide seated chair massages for your employees or at your corporate or marketing event, please call or click here to email us today. In Herbal consultation, Gail teaches you how to use herbs, supplements, correct diet and other natural healing modalities in a systematic manner to obtain dependable results. In this consultation she will use sclerology as an assessment tool, as well as tongue and fingernail analysis. These will help guide her to build a program that is designed to you specifically, using modalities such as pure diet, whole herbs, exercise and therapeutic essential oils. There is no one size fits all in natural healing. You may leave the office with a full program that works for you. This consult will last approximately 1 1/2-2 hours. Click here to learn more about Herbal Consultation. *Assessment and program pricing does not include supplements. When supplements are suggested, you will be able to purchase the highest quality available, at wholesale price. Sclerology is the study of the red lines, gels and colors, in the white of the eyes and how they relate to stress-patterns in a person's health. 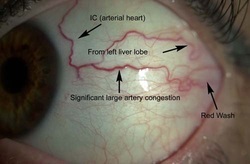 The sclera is a system status indicator that reveals current health issues. A Sclerologist is trained to interpret these findings, and helps you understand how the body is struggling or adapting to maintain balance; and thus know how to apply natural therapies to prevent problems from occurring or help the body correct problems already occurring. Click here for more information about Sclerology.